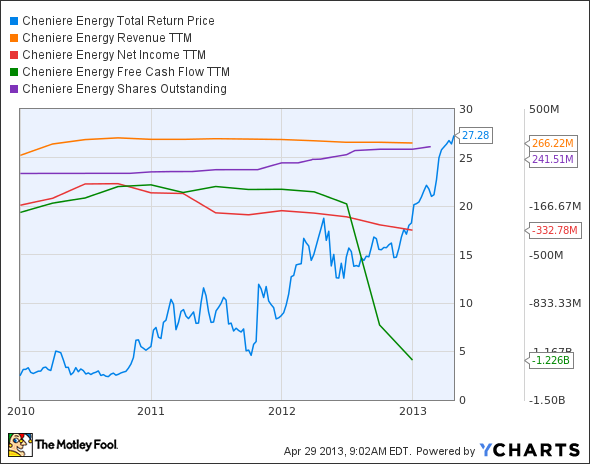 Is Cheniere Energy's Stock Destined for Greatness? Let's see what the numbers say about Cheniere. Investors love stocks that consistently beat the Street without getting ahead of their fundamentals and risking a meltdown. The best stocks offer sustainable market-beating gains, with robust and improving financial metrics that support strong price growth. Does Cheniere Energy (NYSEMKT:LNG) fit the bill? Let's look at what its recent results tell us about its potential for future gains. *Period begins at end of Q4 2009. Cheniere's been a great investment, that much is undeniable -- in the past three years, it's returned nearly 1,000% for investors lucky enough to get in at the beginning. However, little of that optimism is reflected in the company's fundamentals, which merit a middling three out of seven passing grades. Are brighter days really ahead for Cheniere, or are investors only chasing after unsustainable promises? Ever since the end of the 2009 crash, investors and pundits have predicted that Cheniere's unique position as America's gateway to international natural gas transactions -- first as an importer, and then later as an exporter when it became clear that America's nat-gas prices were far below that seen in other developed nations. Cheniere's the only company -- in partnership with France's Total (NYSE:TOT) -- to operate an approved export terminal for liquid natural gas in the United States. While others might get their own terminals in years to come, this is a huge advantage that ought to pay off if everything comes together. It's undeniable that America has vast nat-gas deposits waiting to be tapped. In fact, the amount of natural gas we think we have continues going up as geologists revise their understanding of our reserves, leaving companies with a glut of cheap nat-gas and nowhere to sell it. Chesapeake Energy (NYSE:CHK) has already taken major steps away from the nat-gas drilling game as a result, as have other producers. This should stabilize prices, but there's a long way for nat-gas prices to go in the United States before they reach levels seen everywhere else. My fellow Fool Maxx Chatsko points out the discrepancy between prices here and prices elsewhere, but he also raises a pertinent question: will new discoveries and extraction methods undermine the demand for nat-gas exports? One of the hottest stories in energy today involves methane hydrate, a sort of icy natural gas found on the seafloor near continental boundaries. There's so much of it down there that it dwarfs the amount of carbon-based energy found everywhere else, combined. The problem will be getting it up to the surface and making it useful, but I wouldn't bet against determined countries with a pressing need for energy independence. While Japan pushes forward, America dithers. Lobbying from industrial enterprises, particularly chemical makers Dow Chemical (NYSE:DOW) and Huntsman (NYSE:HUN), is holding back a larger effort to export. A number of companies making products from paint to fertilizer have profited greatly from the depressed price of American natural gas, and offering our surplus (such as it is) on the world market would almost certainly raise nat-gas prices domestically. If and when politicians and business leaders hammer out the details of an American nat-gas export scheme, Japan could be well on its way toward commercializing inexpensive methane hydrates. The window won't be open forever. Will Cheniere let it close? That's the question investors need to ask, since the entire premise of buying shares now is predicated on a long-term return from prime exporter status. Today, Cheniere has few of the qualities that make up a great stock, but no stock is truly perfect. Digging deeper can help you uncover the answers you need to make a great buy -- or to stay away from a stock that's going nowhere.